are our Most Important Priority! At Oakridge Crossing Dental, your health and safety are extremely important to us. 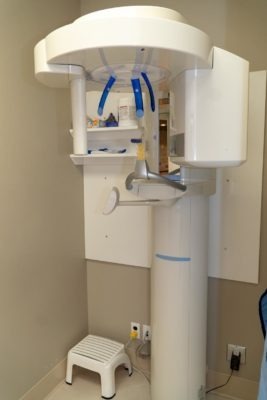 Our goal is to exceed the Alberta Dental Association and Canadian Dental Association dental health and safety guidelines, with the use of hospital-grade sterilization equipment and sterilization practices that are followed by our highly trained team. Our dental health practitioners always wear gloves, masks and protective eyewear as a protective barrier for every appointment. Products that go into the patient’s mouth are either used only once and disposed of, or they are sterilized in our sterilization lab. All dental instruments and headpieces (drills) are sterilized in a high-pressure steam autoclave daily. This process is the standard of care. 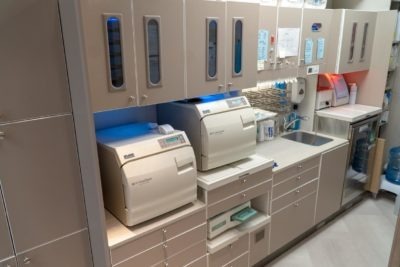 Our computerized autoclave warns us in the event of an incomplete sterilization cycle, and we have protocols in place to correct such issues immediately. As an added precaution, we also use an external biological indicator test to ensure that our autoclave is functioning properly and producing sterile instruments. All surfaces including countertops, dental chairs, stools, light handles and control buttons are disinfected with chemical solutions before and after every patient. These solutions are not only formulated to eliminate infectious bacteria and viruses that could otherwise proliferate on these surfaces, but the chemicals themselves pose no health threat to our patients. Many of the items we use today are discarded after a single use. These items include saliva ejectors, high-speed suction tips, drinking cups, rubber cleaning cups, patient bibs, tray covers, sterilization bags, mixing pads, mixing tips, anesthetic carpules, and needle tips, among others. Gloves and masks are also discarded after each use. If you have any questions about any of our dental health and safety procedures, please do not hesitate to ask us at your next visit, contact us at (403) 475-9800 or request your appointment today!